Windows 98se, 2000, XP, Vista. No need for awkward timeout settings that mistakenly lock the PC when you are present. The TF2000 can detect your presence and will not lock the system inadvertently. The TF2000 attaches to the PC via the USB port and is configured by the system as a keyboard. Commands are simply sent to the PC as keystrokes therefore no special drivers are required! The individual keystrokes and specified delays are all configurable. In addition, to the ‘walk-away’ command, the TF2000 has a ‘walk-to’ sequence which allows keystrokes to be sent when you approach the PC. For example, under Windows XP the TF2000 sends the CTRL-ALT-DEL sequence when the user approaches the PC. This readies the PC for user authentication. When the user leaves the PC, the TF2000 sends the Windows Key+L key sequence to secure the session and put the Client PC back into login mode. The TF2000 sensor now locks the unattended computer automatically! The TF2000 incorporates a sophisticated ultrasonic sensor to detect the presence of the user. When the user leaves the defined distance, the TF2000 sends the keystrokes to lock the system. These would be the same keys the user should have hit prior to leaving the system. On a user’s return, the TF2000 detects the presence of the user and can optionally send keystrokes to initiate the log on process. When it comes to locking the unattended computer there are few choices. Most administrators are forced to either rely on the user to manually lock the computer or on inactivity timeouts. Both of these methods are generally undesirable and unreliable. Users often forget to lock the computer while leaving. Time-outs are often set too long creating a security risk, or set too short becoming a nuisance to the user. On a user's return, the TF2000 detects the presence of the user and can optionally send keystrokes to initiate the log on process. Easy Installation...No Special Drivers Installation of the TF2000 is a snap! 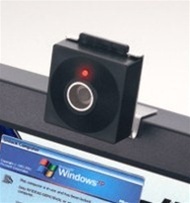 The TF2000 attaches to the computer as a USB keyboard, using drivers provided by the Windows® operating system. The computer simply thinks the user is hitting the keys. All configuration of the TF2000 is done through the supplied configuration utility. Programming of the keystroke sequences, timeouts and other options are easy to modify and are stored in the onboard non-volatile memory of the TF2000. With the TF2000, computers can be put into stand-by mode immediately upon the users departure. No more unattended computers wasting energy and dollars. The TF2000 starts paying for itself immediately.